Photos for this Proboscis monkey information were taken on my Borneo orangutan holidays run in partnership with The Orangutan Foundation UK. There’s a few more photos of Proboscis monkeys jumping and leaping here. Malaysian Borneo – Baku National Park; Danum Valley wildlife reserve; Labuk Bay Proboscis sanctuary. Proboscis monkeys are highly arboreal, spending nearly their entire lives in trees. Occasionally they come down to swim across rivers or forage on the forest floor. Typically living in small groups consisting of one dominant male and up to eight females with their offspring. Rival harems are often seen quite close to each other along rivers where they come to sleep high in trees. Male proboscis monkeys are well endowed in the nasal department with bigger noses than any other primate. Reaching up to 17cm long, their impressive conks are so large that sometimes they need to push them out of their way while they eat. Along with being a desirable asset to impress females, their noses also have another use, as when threatened they use them to amplify their warning call. 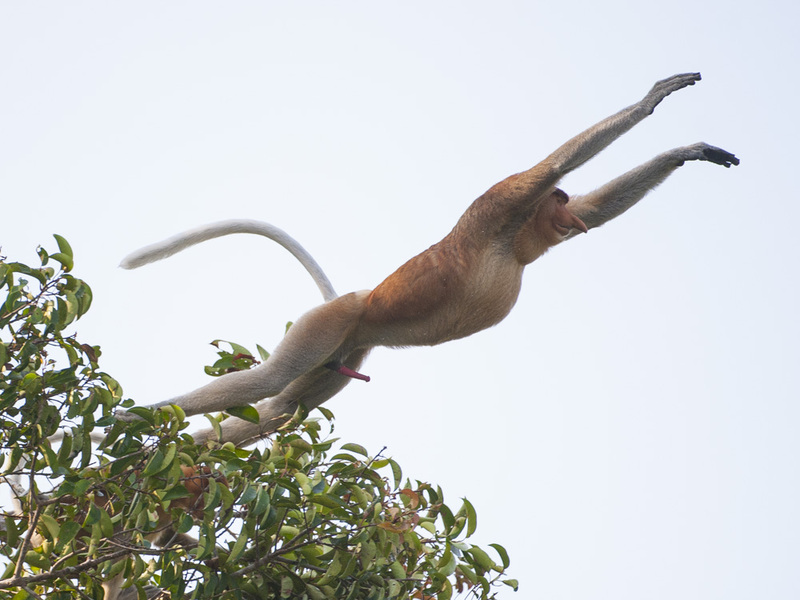 One of the great pleasures of watching Proboscis monkeys is seeing them leap from tree to tree. Usually they’ll move through the forest in a ‘follow the leader’ routine often making spectacular leaps of faith. You might also witness them hurling themselves into rivers and paddling frantically to the other side. With webbed feet and hands, they are one of the world’s best primate swimmers enabling them to outpace crocodiles which are their main predators. Proboscis monkeys mainly feed on a diet of leaves, seeds, and unripe fruits. Their pot bellies aren’t the result of overeating though because their stomachs are distended by a number of digestive departments where bacteria breaks down the leaves. This process is extremely slow and their stomachs can contain up to a quarter of their body weight. 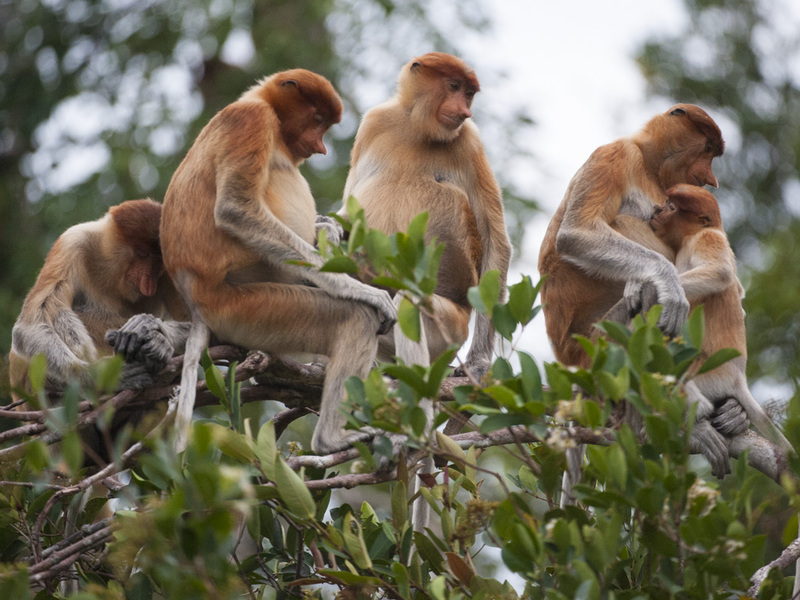 Proboscis monkeys have been hugely affected by deforestation and illegal logging in Borneo.Tanjung Puting national park is home to one of the most important remaining populations because this area is so well protected. Great daily sightings are all but guaranteed on my Borneo orangutan holidays which contribute to the conservation of these forests.